By now we are used to the idea of seasonal weather forecasts - whether to expect an El Niño ski season, or an unusually warm summer. These same types of climate models are now being adapted to make seasonal forecasts for the region's coastal waters. Researchers from the University of Washington and the National Oceanic and Atmospheric Administration have created a seasonal outlook for the Pacific Northwest waters, which would help tell if it's going to be a great year for sardines or a poor crab season. A paper evaluating the forecast's performance was published in June in the interdisciplinary, open-access journal Nature: Scientific Reports. "Ocean forecasting is a growing field, and the Pacific Northwest coast is a particularly good place to use this approach," said lead author Samantha Siedlecki, a research scientist at the UW-based Joint Institute for the Study of the Atmosphere and Ocean. "This paper is doing what the scientific community asks of a new tool, which is assessing how well it performs." The tool, called JISAO Seasonal Coastal Ocean Prediction of the Ecosystem, or J-SCOPE, launched in summer 2013. The new paper is the first formal evaluation of how well it works. Analysis of the first three years of forecasts confirms that they do have measurable skill on seasonal timescales. The seasonal forecasts for water oxygen, temperature, chlorophyll and pH along the coast of Washington, Oregon, Puget Sound and Canada's Vancouver Island have been posted for the past three years on the UW-based Northwest Association of Networked Ocean Observing Systems website. That site now offers a comparison between the forecasted values and the long-term average, and the probability for different scenarios. "The forecasts have been evolving over the years," Siedlecki said. "We're trying now to put the forecast in context -- is this better or worse than in recent years?" 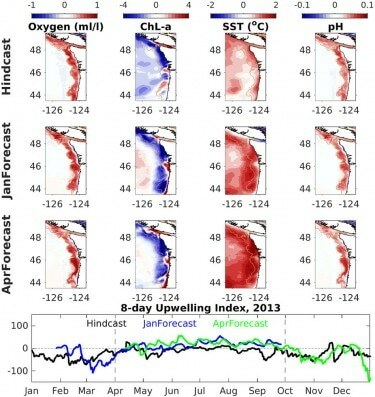 Analyses in the new paper show that the tool does especially well at the beginning of the spring upwelling season and matches observations most closely below the surface. This is good, Siedlecki said, because that's exactly where measurements are scarce. "Our tool has more skill in the subsurface for things like bottom temperature and bottom oxygen," she said. "That's exciting because it can inform us where and when the low-oxygen and corrosive conditions that can be stressful to marine life would likely develop." The fall season is more storm-driven, she said, and consequently difficult to predict. The tool takes long-term NOAA forecasts and combines those with a regional ocean model to produce the outlook. The goal is to eventually combine the ocean forecasts with fisheries management, so that decisions surrounding quotas could take into account the conditions for the species' habitat during the coming season. A sardine forecast was recently added and was the focus of a separate NOAA-led paper published this winter in Fisheries Oceanography. That forecast shows moderate skill in predicting sardine populations five or more months out. The group now has funding from NOAA's Northwest Fisheries Science Center to work on forecasts for hake, also known as Pacific whiting, since the widely-fished species lives below the surface and seems sensitive to oxygen concentrations. The researchers are interested in developing similar forecasts for salmon and other species. Forecasted values include pH and aragonite, a calcium-containing mineral that marine animals use to harden their shells, so the tool can also help predict which months will have good conditions for growing shellfish. "The oyster industry has already been treating the intake seawater coming into the hatcheries," Siedlecki said. "If our forecasts can help the growers identify times of year that would be most suitable to set up juvenile oysters out in the open ocean, that would potentially help them get a leg up on changing conditions." For this summer, the outlook may be good news for ocean swimmers who like warm water and bottom-dwelling fish that sometimes struggle to breathe in the late summer or early fall. "The current forecast is showing weak upwelling, warmer temperatures and higher oxygen than we've had in the past, so a bit of a relief in some ways for the ecosystem," Siedlecki said.